A fascinating case study for open reporting of gallery technical findings is currently playing out in the press and online. Such discussion is usually confined to specialist journals or academic symposia, though in this instance has spilled into the public sphere owing to the great popularity of the artist in question. There can be no doubt that the latter part of the twentieth century has been pervaded by Leonardo mania - currently at a post Dan Brown crescendo owing to the recent, highly popular exhibition at the National Gallery London. Amidst this frenzy of public interest, the Prado Museum in Madrid has chosen to reveal its long-held copy of the Mona Lisa has been discovered to be a workshop copy. The bulk of the conclusions made about the Prado Mona Lisa centre around interpretation of infrared undersurface scans. The full report of which can be viewed at the Prado website. At a basic level, images of artworks taken in the infrared spectrum allow light to penetrate through the superficial layers of paint, giving impressions of preparatory underdrawing and changes made to the composition at this level. Infrared technology hence gives art conservators and historians a diagnostic ability not unlike a health professional trained to read radiological scans. Below is an edited version of the Prado technical clip, presented by Ana González Mozo. It provides a sample of the methodology employed by the Prado staff to arrive at their conclusions. It is an impressive presentation - the most striking factor being the numerous points of comparison, constantly made between infrared images of the Louvre version versus the copy. The summation of these factors boils down to a number of changes being made at an underdrawing and painted layer level, indicating changes made to the Louvre version were being repeated by the artist(s) responsible for the Prado version. The conclusions seem logically sound at many levels, where mirrored changes seen in subsurface layers of both images reflect a close proximal relationship between the works during their production. The only thing missing from the Prado's presentation is a discussion of possible elements that could be confounding these findings - namely, factors that influence the reading of results in a particular direction. A gap between observation and conclusions? As discussed in the case of the Allendale Nativity attributed to Giorgione, conclusions derived from infrared scans can sometimes be presented as fact, often prefaced with the phrase "scientific analysis has revealed". The modality to capture the scan has a scientific basis, but its analysis involves a degree of interpretation that introduces subjectivity and further potential for error. Conclusions made from lines on a scan sometimes can reveal insights regarding temporal relationships between copies of works - namely that one was created before or after another. Whether this relationship is actually present depends on the number and quality of factors compared across samples, verified against other data such as pigment and layer analysis. Using the example of scans used in the medical field, the final word is always left to the radiologist - a medical specialist whose training has been devoted to diagnostic proficiency. Although there are regional variations, radiologists across the world are hence equipped with a standard level of training and formalised language for reporting their findings. Conversely, the use of undersurface scans in art inquiry contains exponents with a much more variable level of training. Some work in conservation, others are art historians or even art dealers with an interest in verifying authenticity. In the case of the Prado Mona Lisa, we have had reports from each of these quarters. At Art History News, Dr. Bendor Grosvenor - an art historian, art dealer and co-director of the Philip Mould Gallery in London - puts forward some pragmatic and well reasoned points of discussion. While he is careful to maintain these points in a hypothetical realm, his language suggests he has some difficulty accepting the Prado verdict. Having viewed the Prado's presentation, aspects of it do firmly state their conclusion of the piece as a workshop creation. We can query their use of language, perhaps more ideally presented in a more probable sense. Grosvenor's own queries address differences he sees - a valid exercise. Ideally, such critiques must also extend beyond differences, and instead try to provide plausible accounts that explain the total accumulation of factors. In the case of the Prado copy, the infrared scan is one part, but not the complete picture. Other details, not addressed by external commentators are the uniformity of the many of substances used in creating the picture. These are mentioned partly in the Prado video presentation. A more conclusive statement about workshop involvement could arise from the demonstration of chemically consistent materials, in both the support and pigment layers. A ground layer apparently unique to Leonardo and his pupils is noted. In addition, Lapis Lazuli was discovered in the Prado variant - an expensive blue pigment imported from what is now modern day Afghanistan. This factor seems to suggest that the copy did have an intended destination and owner - rather than a workshop experiment - something not presently confirmed as the early provenance of the Prado version is unknown before first noted in a Palace inventory in 1686. In addition, we presently have no record of a patron receiving either portrait. The present view is that the Louvre painting was completed intermittently, and forever remained with Leonardo until his death. After this it was inherited by his pupil Salai (Gian Giacomo Caprotti), who then sold it onto King Francis I. Did a Leonardo pupil (possibly Salai) have also been working on their project intermittently, thus accounting for some of the undersurface similarities? What sense is there in making a duplicate of a work of a seemingly anonymous sitter, unless that sitter was not so anonymous. Or possibly the patron was a person who was not so much important as closely associated with the sitter, given that it is perfectly logical to produce copies of devotional works or portraits of known sitters. There are numerous examples of copies of that type but not of copies of portraits of supposedly anonymous sitters. Leonardo undertook to execute, for Francesco del Giocondo, the portrait of Monna Lisa, his wife; and after toiling over it for four years, he left it unfinished; and the work is now in the collection of King Francis of France, at Fontainebleau...The eyebrows, through his having shown the manner in which the hairs spring from the flesh, here more close and here more scanty, and curve according to the pores of the skin, could not be more natural. The nose, with its beautiful nostrils, rosy and tender, appeared to be alive. The mouth, with its opening, and with its ends united by the red of the lips to the flesh-tints of the face, seemed, in truth, to be not colours but flesh. In the pit of the throat, if one gazed upon it intently, could be seen the beating of the pulse....And in this work of Leonardo's there was a smile so pleasing, that it was a thing more divine than human to behold; and it was held to be something marvellous, since the reality was not more alive. This was seemingly corroborated in a marginalia note found in 2005 by archivist Dr. Armin Schlecter. Dated October 1503 by Florentine Agostino Vespucci, in a 1477 edition of Cicero's Epistolae ad familiares, he notes that Leonardo is working on a portrait of Lisa Gheradini, also lauding Leonardo as the new Apelles, the ultimate compliment one could pay a painter in the Renaissance - since the greatness of the ancient Greek painter Apelles was described by Pliny and recounted by Alberti in his treatise on painting, De Pictura. Another report is provided by Oxford University's Professor Martin Kemp, often sought for opinion owing to a lifetime of study dedicated to Leonardo. His brief statement, recounted at The Art Newspaper reveals a focus on the technique used in the Prado variant versus the Louvre piece. It should be noted that Professor Kemp made these statements from examining high resolution photographs of the Prado piece. It is a somewhat cautious statement which neither confirms nor denies the common origin theory put forward by the Prado. ...the head is very pretty, but speaks of a careful pedantry which only hints at Leonardo’s melting ambiguity...the details of the hair and dress are based on close observation of Leonardo, but exhibit a certain niggling exactitude that comes from careful emulation. From the evidence presented so far, a more thorough evaluation of the workshop hypothesis can eventuate taking the data from the Louvre and Prado pieces as a starting point, and adding more points of comparison from works by Leonardo's pupils, particularly Francesco Melzi and Salai. This also seems to be the focus of the next phase of the Prado's investigations, with reports of comparative studies being made on the copy of the Virgin and Child with Saint Anne by Salai, now at the Hammer Museum in California. Another prominent online commentator on the case is Professor Noah Charney, an art historian and art crime specialist. Now a resident blogger at ArtInfo, Charney is a dynamic advocate for interesting and accessible art history. Whilst much of his work focuses on art crime, there is an impressive methodological undercurrent to his approach - demonstrating a logical process not commonly seen in traditionally trained art historians. 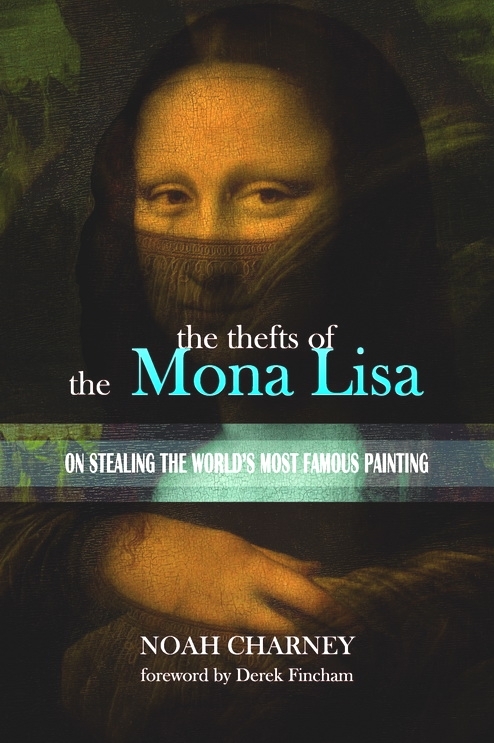 Charney's most recent publication is The Thefts of the Mona Lisa, a concise history of the events that catapulted the Mona Lisa to its present status as the most famous painting in the world. To this point it could also be added that workshop copies were also not uncommon - which the Prado presentation argues their version is an example of. Interspersed between the historical accounts are thought provoking observations on the nature of the fame the picture has garnered and how this familiarity has obscured the work's place in the progression of Renaissance and European portraiture, instead becoming a target for imaginative theories about hidden meanings, usually backed with very little supportive evidence. Despite its renown, the Mona Lisa is what has been called an "invisible" icon - something so famous that people have ceased to really look at it or know anything about it beyond its title and creator...part of the problem is that many people assume that they know something about it, simply because they know of it. This results in a failure to fact-check what they do know, or to add to their knowledge....Mona Lisa's fame comes from the cult of its author, Leonardo, and the praise that the painting has received, quite consistently, from its own time to the present. Another fascinating part of the book revolves around Picasso's role as one time suspect in the theft in the Mona Lisa case. It is a recommended volume for those interested in an accessible and enjoyable account that separates fact from myth for the painting that continues to accumulate a wild mythology into the present day. Art conservation and attribution research is increasingly becoming an interdisciplinary effort. That its exponents are not fully versed in appropriate modes of reporting is the responsibility of individuals and organisations working in this field. Working towards a type of reporting written in a standardised language and with a methodical structure is the way forward, and would allow a more natural comparison between results discussed. In addition, a preferred mode of reporting should ideally describe every unique feature, including those anomalous to the final conclusion. The Prado's presentation in an openly accessible manner, and the astute comments made by qualified observers have provided an interesting example of the power of the web to foster discussion on these topics. It is hoped future discoveries are presented in a similar manner, working towards not only a standardised language, but the implementation of a peer review system that encourages detailed discussion and review of findings presented. Many thanks to ARCA publications for the supply of the review copy of Professor Charney's book. Proceeds from the sale of this book go to support ARCA's work in education and research into crime affecting the arts. An interesting and thought-provoking post, which I hope triggers a lot of discussion! And many thanks to the Prado as well for their refreshing seriousness and unwillingness to feed the current epidemic of mindless "discoverymania". You make an essential point: "Scientific evidence reveals..." is only the beginning of a complex process. Far too often, it is difficult to tell where methdological sloppiness ends and calculated obfuscation begins. It is now becoming less easy for people to hide behind Wizard of Oz-like posturing and pronouncements--so, keep up the good work! What a variety of reactions to this work of art! I think you have done well to point out the gap between scientific observations and conclusions. It's easy for individuals to come to a certain conclusion if they are looking for evidence that will support such a conclusion. How hard it is for one to be without bias! @Ed - Cheers. The old standards of authority based on reputation of the author/publication is increasingly being replaced by a desire for a fuller description and an underlying sound methodology. At one point (eg. 1970) someone could publish a piece in the Burlington which quite simply would not stand up to scrutiny (as recent cases studies reveal!). With the likes of Kemp, Grosvenor, even 3PP readily commenting on investigations in a timely and accessible manner, the future promises a bit more clarity on these matters at the very least. It is also great step forward that the Prado presented the technical staff directly relating their work, this also would have been less likely in the past. @Alberti's Window - maintaining what I call a "neutral review" posture is very difficult - and I'm speaking as someone who has trained in the sciences and needs to write in his manner on a daily basis in case notes etc. How this task would be to someone trained in the humanities, which is not traditionally geared towards objectivity is a great challenge. The discipline is fortunate to have the likes of yourself, Prof Kemp, Prof Charney and Dr Grosvenor who will engage on discussions of not only evidence, but the validity of that evidence - a vital part of improving the quality of presented information. At the end of it all, I'm truly most fascinatied by Ana Gonzales Mozo's repeated references to "anonymous sitter" - The Gheradini identification has been accepted by the scholarly community for a long time - and despite Vasari's occasional sketchiness, it seems his description of the piece and the sitter matches the painting we know. Why then is the Prado staff member using the term "anonmymous sitter"?! Why would Leonardo arrange to have a copy made simultaneously with the original? An explanation might be found in the article, “Leonardo’s Val di Chiana Map in the Mona Lisa”, in the peer-reviewed journal, Cartographica, 46:3, 2011, available at http://digital.utpjournals.com/issue/43517/7 . The article explains that two copies can be arranged side-by-side and aligned so that the image on one copy is seen to continue on the other copy. The newly reconstituted landscape matches an actual place, namely the Val di Chiana, as mapped by Leonardo. 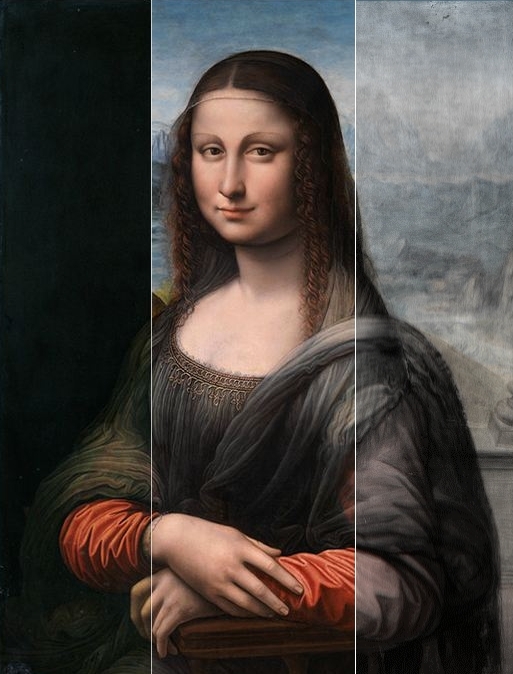 Two such juxtaposed copies also form a stereoscopic arrangement which is an example of what Leonardo described in his Notebooks under “Differences of perception by one eye and by both eyes”. This is part of his investigation of stereopsis. A more likely interpretation of the evidence is that both the original and the Prado copy were started in 1503, by master and student, respectively. The Val di Chiana map, of 1502, was present, along with both copies, in the studio and it was the subject of the background. The landscape would have been well under way, even before the sitter. Some changes, as documented in the under-painting evidence would have been buried under fresh layers, so that any one seeing the paintings within a few years of then would not see major changes a decade later even if repeated layers and “touches” were added. The rocky outcrop drawing and other sketches of 1510 have little to do with the Mona Lisa other that demonstration of the same technique. The Louvre and the Prado had an argument in 1910 who was the owner of the real Mona Lisa. Walter Littlefield tried to solve the situation in an article he wrote for the century magazine in 1914, where he attributed the two canvases both to Leonardo. The style of the Prado painting shows that Giampietrino is a possible pupil who painted the canvas in a close collaboration with Leonardo. The landscape of the bare breasted Magdalene Painting which was attributed by Carlo Pedretti to Giampietrino and Leonardo has close similarities in the landscape. Melzi had a different style and was probably too young (born 1492) for the Prado painting, because it is highly possible that it was finished before 1506. Leonardo painted almost every canvas in collaboration with his pupils. He was introduced in the workshop methods when he worked together with his master and teacher Andrea Verrocchiofor a strange long time of seven years. The reason for this long contribution to Verrochios workshop was, that Leonardo realized very early in his artistic life an obsession for the fragment. This obsession is very obvious, when we compare his countless plans and projects with the number of finished works in his long life. Leonardo concluded that he could bring his many brilliant ideas to the light only in close collaborations. So he decided to open his own workshop about 1500.
regarding the painting he recognized, that it was impossible and useless to teach his pupils to work in his invented and beloved sfumato style, where he painted many layers on top of each other in a kind of a meditation. It could last many years till a canvas was finished. He painted only a few canvases in this sophisticated style and they were his most personal works of art. The most prominent sfumato painting was the so called Mona Lisa from the Louvre. If he had planned at the start of the Mona Lisa painting to fulfill also the wishes of a customer, it was logic and necessary to produce in a regular painting style a copy in colaboration with his workshop. So we can conclude, that the masses of ideas in his mind and the wishes of his customers forced him to use the workshop methods. Leonardo never influenced his pupils in a way like Rembrandt did, so they could all develop their own painting styles. It is also thinkable that two or three pupils and the master worked together at one painting, like it is the case with the Bacchus, Pomona and Vertumnus and the second madonna of the rocks to mention only a few of them. Wilhelm Suida wrote a very good book about Leonardos workshop in 1923. It is a miracle that nobody else folowed his path with the exception of Carlo Cedretti in almost 100 years! In future, I would also encourage anyone with *so much* to say to do so in their own webspace - a simple link to the journal article or the art history news link would have sufficed. What is proposed is a fascinating theory. However, as can be commonly demonstrated, iconographic studies are invariably speculative, barring a primary source that verifies this thematic program as the artists intention. In this instance the Val di Chiana map is an important source, but an unequivocally conclusive one? We have other examples of natural phenomena depicted by Leonardo that were not accurate, but involved an element of imagination. That a specific location/source has been identified is interesting, but only as far as we know it may have provided a visual source for the landscape(s) depicted. Leonardo's reversal of the background halves can have as much to do with composition than a deep commentary of natural processess. A continuous landscape in the background (as seen in the Madonna of the Yarnwinder) would introduce a different aesthetic dyamic to the single figure portrait. By re-arranging these elements it could be argued that Leonardo has preserved space around the top of the figure to accentuate the pleasing pyramidal aesthetic. I am also not sure how the source of the Val di Chiana map detracts from any of the statements made by the Prado in this instance, who Donato unfortunately labels "so called experts." Their reasoning is for most part quite sound. If a pupil was working from a compositional sketch or cartoon at the start, and did not have this later on, this can potentially account for the differences seen in the Prado version - as well as explaining why the incomplete background was covered over. Making dating estimates based on such indicators is perilous, as you know the latter date merely comes from a documentary source and can presently not be extracted from any physical samples of the work. More clearly, the common ground and mirrored underdrawing changes are good indicators for the works at least being started in tandem, or from a common origin. I would be interested in seeing more complex results from pigment and layer analysis of both versions, as well as Leonardo's and his pupils' works. Again, we are grateful to the Prado for making their information openly accessible - where art historians like Professor Kemp and Dr Grosvenor have been able to respond, not to mention myself providing this summary. Unfortunately we can not say the same for the Cartographica piece, out of reach to many in a paid journal - I would also submit that a peer review for such a specific art historical query would best be handled by scholars more familiar with Leonardo's work. I understand the cartographic link - but there is more to this story than the map alone. It is unfortunate for Leonardo scholarship in general that such findings are discussed in such a sensationalist manner - perpetual "new discoveries" and "mysteries solved"..
Leonardo of all artists having used a geographical model for a painting is hardly a mystery. That it may have been derived from an actual observation or location he may have seen is also not a particular trait of Leonardo's, but quite commonly observed in art from prehistory onwards. Yes I did post the comment of March 31, 2012 10:19 AM. My objection is that an expert has taken one piece of evidence, to make a claim that would significantly change our understanding of Leonardo’s work, while ignoring a mass of other evidence. The purported match of Leonardo’s Rocky Outcrop sketch to an element in the Mona Lisa, is flimsy evidence being used to claim that a significant portion, if not the whole of the landscape was added more than a decade later. This goes against logic and a wealth of evidence to the contrary. There is the traditional claim by the people of Arezzo, that theirs is the landscape of the Mona Lisa. There is the identification of the Buriano bridge by Starnazzi, which was endorsed by the prominent Leonardo expert Carlo Pedretti. There is the analysis by the Louvre’s (C2RMF) Centre de Recherche et de Restauration des Musées de France, which concluded that the landscape was painted before the subject. There is the obvious evidence on the painting that hair and veil are painted over the background. There is my article, “Leonardo’s Val di Chiana Map in the Mona Lisa”, which makes the case for a high degree of correspondence of the map to the landscape. A more logical interpretation of the evidence is that master and pupil stared their respective paintings with the composition, including landscape and subject, well established, minor adjustments were made early on. 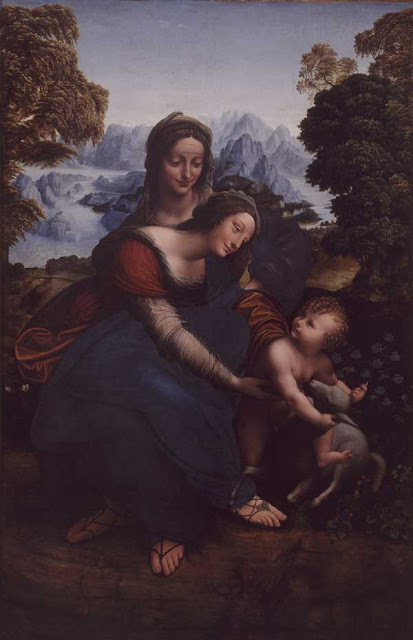 The nature of the copy would suggest the it was finished early, while Leonardo continued indefinitely adding layers and touches, but not substantially altering the composition. Your final sentences essentially mirror what is being said by the Prado technician - please see quote below the video. I would also be careful to clarify which expert you are citing. This article is primarily about the Prado version. In their text presentation and two videos, a reference to the "rocky outcrop" is only made in the text version noting "A surprising element, for example, located to the right of the figure, is the area of mountains taken from the autograph drawing by Leonardo of A rocky outcrop (ca.1510-15) in the Royal Collection, Windsor." This is carefully stated, as in everything else presented by Prado staff in this case. Perhaps you are referring to the article in The Art Newspaper "Mona Lisa could have been completed a decade later than thought" link - a vague piece of reporting that seems to be paraphrasing un-named "Louvre specialists"
"Louvre specialists went back to photographs taken of the original Mona Lisa in 2004. They realised that the design for part of the rocks on the right side in the Prado copy also appears in the underdrawing of the original, in a blurred form. This can just be made out in an emissiograph, an image made using an x-ray technique." Is any of this "significantly changing" the way we view Leonardo's work? Surely not! The dating of the Louvre piece has always relied on documentary factors - the sighting in France and Leonardo's own admission much of his paintings are unfinished. The Louvre have apparently officially extended the date range- which has been published long since the Prado variant came to light. What could "significantly change" how we view Leonardo? I would suggest the answer is not in rocky outcrops. Arguably, the only literature ever published on this painting in the last 100 years that has significantly "changed" our perception of Leonardo's work was the digital cleaning performed by Lumiere Technology - that shows us a much closer approximation to the original viewer experience from a colour perspective - which this Prado copy is an analog of. Everything else is the domain of hubristic commentators who seem intent to dicuss this painting into the ground. That you have chosen to zero in on a point that is also not a major factor of the Prado investigation makes it hard to understand your motives, other than promoting awareness of your article, which you seem to putting some energy into mentioning, both here at 3PP, and here, and here and here. I would again suggest it is much easier to have your own webspace and centralise your findings there rather than travelling the web handing out virtual fliers for your a journal that costs $230 a year to subscribe to...a great irony given the central theme of this post is to applaud the Prado's efforts at open reporting! If you go to the site mentioned in my comment, and click on free preview, you could read the article for free. The scientific methods of cartography, are used in the article to bolster my hypothesis, of a landscape-to-map match, with as much validity as spectral analysis of the paint layers or pigment analysis. People are free to go to the site and judge my argument for themselves, all in the spirit of open reporting. Thank you for the clarification Dr Pezzutto. For those that do follow the link, a preview of some pages can be viewed. Your statement, "with as much validity" requires clarification. Looking at layering of pigments gives us information only on specific items - chemical composition of actual substances used, which may have correlation with other works from the artist and time. On the other hand, do we really need the "scientific methods of cartography" to prove that Leonardo sourced some landscapes on observed structures? This and the Battle of Anghiari discussion hold most of my art history interest these days. I was wondering if it is known where physically the Mona Lisa was painted? Do we have an idea as to which building's window/balcony we may be looking through behind Mona Lisa and, is this the scenery outside that window/balcony? Or, are both the window/balcony and scenery added from actual known locations and vantage points and painted before or after Mona Lisa was added? A final possibility is that the window/balcony and scenery are both inventions by Leonardo based on known locations. Hello Jeff. It is largely believed the Louvre version of the Mona Lisa originated in Florence. This is based on a few factors, though primarily Vasari and Vespucci's accounts of the painting being of Lisa Gheradini (del Giocondo). I am not certain if anyone knows where Leonardo executed his work on the panel - he could have sketched her from life and worked on a the panel in a separate locations. The suggestion of a common cartoon for the Louvre and Prado versions, as well as the subsurface similarities seem to suggest that the works (or at least the cartoon) was not too far away in the early stages. Other evidence the Louvre piece was in Florence comes from "quotations" by other artists, perhaps the most well known (at least to me) is the drawing now at the Louvre attributed to Raphael. The colonnades seen forming the borders of the work are more likely to be artistic convention rather than a depiction of a particular location - this form being originally noted in Northern works, of which Leonardo was aware and had already shown allusions to in earlier works such as the Benois Madonna, which shows another Flemish style motif of an arched window in the background. It may be worth noting that Northern artists such as Jan van Eyck used to embellish portraits with realistic depictions of stone - often on the frames and and borders of painting. This was done to add distinction to the work, and as testament to the artists skill in rendering both the figure, and stone in the manner of a sculptor. A lovely surviving example of this is the Portrait known as "Leal Souvenir"
When I saw the Louvre Mona decades ago, the overwhelming impression was - so tiny, so far away, so much dark damage under restoration. I do not remember a Prado copy on display, or even knowing such existed. Economics of studio production suggest, to me, the Prado, with costly walnut backing, and concomitant alterations, perhaps was intended for the customer. Thanks for the captioned video (two beautiful Italian women are vast improvement on usual "talking heads"), fine resolution reproductions, and reasoned expert discussion, available to dilettantes as well.